One of the joys of summer for me is preserving some of the abundance of fresh produce for use throughout the year. The ritual of getting out the canner, the tools, the jars, lids, and rings makes me feel so productive. I usually do several types of fruit preserves and a couple of kinds of pickles. The only thing I don’t like about homemade preserves and sweet pickles is the amount of sugar that most recipes require. Most fruit preserves call for as much, and sometimes even more, sugar as fruit. And the same with sweet pickles. I just feel so guilty pouring all that refined white sugar over that gorgeous fresh produce! That’s why I started looking around for a bread and butter pickle recipe without all the usual sugar. 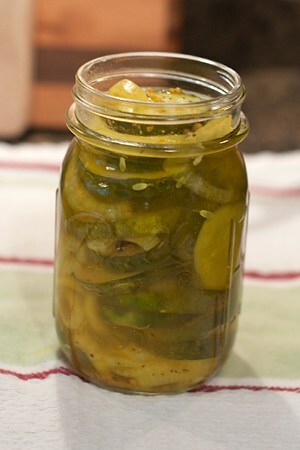 I really love bread and butter pickles with their mix of cucumbers and onions in that sweet, tangy solution. They’re one of my favorites! But my old standard recipe called for 2 1/4 cups of white sugar. Eeek! I could just never feel good knowing I was eating all that sugar. So when I saw this recipe from Splenda that uses their substitute I thought I’d give it a try. Now, it doesn’t have the exact taste of a “B&B” made with sugar, but it’s really darned close. If you enjoy bread and butter pickles but want an alternative, then these sugar-free bread and butter pickles might be just what you’re looking for, too. 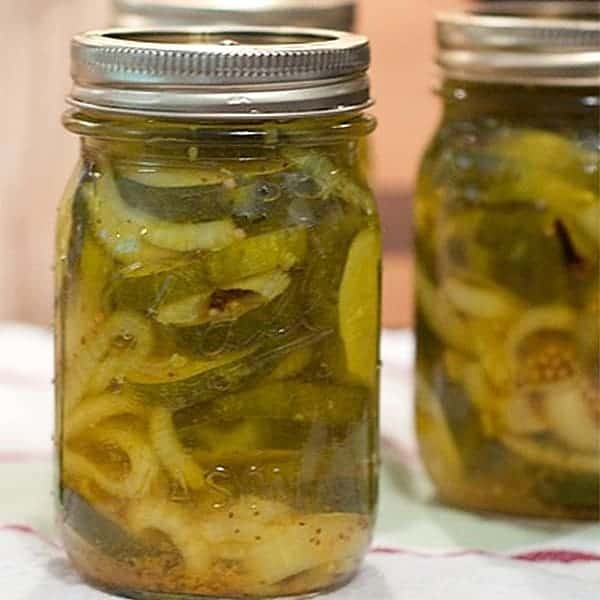 First, you want to make sure that you use only pickling type cucumbers for your pickles, not the standard grocery store cukes that have been waxed. Those just won’t work. 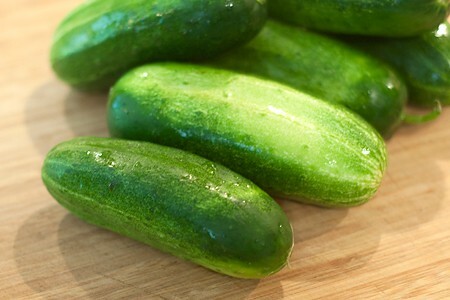 Prepare the cucumbers by washing thoroughly to remove any dirt from the skin. Remove a thin (1/16 inch) slice from the blossom end of each cucumber and discard. 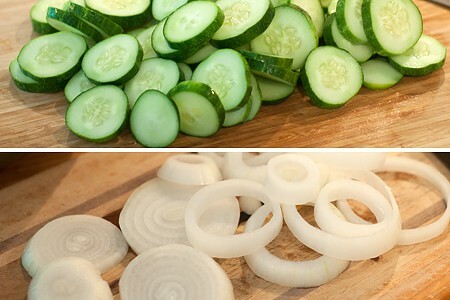 Slice cucumbers into rounds approximately 1/4 inch thick. Peel the onion and slice it into 1/4 inch thick slices as well. Separate all the onion rings. 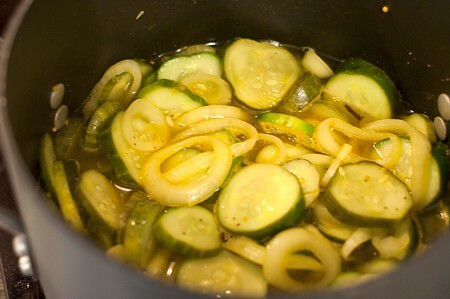 Place the cucumbers and onions in a large bowl and sprinkle with the salt. Toss so that the salt is distributed throughout the vegetables. Allow to stand at room temperature for two hours. Drain the cucumbers and onions in a colander. Rinse thoroughly and drain again. Spread the vegetables on a double thickness of paper towels and pat dry with additional paper towels. Prepare 3 pint (or 6 half-pint) jars by washing in hot soapy water and rinsing well. Prepare lids and rings according to manufacturer’s directions. Fill a boiling water canner 3/4 full with water. Add the clean jars to the canner and bring to the boil. Keep lids warm in a pan of barely simmering water. Meanwhile, combine the vinegar, sugar substitute, mustard seed, celery seed, turmeric, and cloves in a large saucepan. Bring to a boil over medium-high heat. Add the cucumbers and onions and allow the mixture to return to a boil. Working with one jar at a time, use a slotted spoon to pack vegetables into hot jars filling to 1/4 inch of tops. Ladle in pickling liquid to cover the vegetables. Wipe the jar rim with a moistened paper towel and apply a canning lid and ring. Rings should be just fingertip tight. Return the filled jar to the canner and continue until all jars are packed. When all jars are filled, lower the jars into the boiling water canner. Water should cover the tops of the jars by 1 to 2 inches. Cover the canner and bring the water to a gentle boil. Process for 15 minutes. Remove jars from the canner and place on a towel to cool completely. After the jars are cool, check to make sure the seals are complete. Store in a cool, dark place for up to one year. Refrigerate jars after opening. Enjoy! A homemade, sugar-free bread and butter pickle. Prepare the cucumbers - wash thoroughly removing any dirt from the skin of the cucumbers. Remove a thin (1/16 inch) slice from the blossom end of each cucumber and discard. 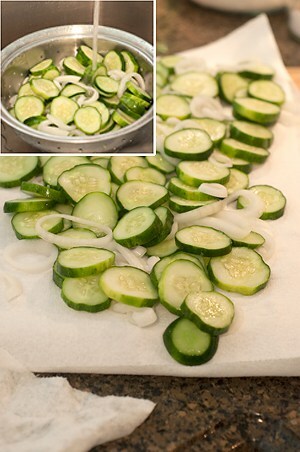 Slice cucumbers into rounds approximately 1/4 inch thick. Prepare the onion - peel the onion and slice into 1/4 inch thick slices. Separate the onion rings. 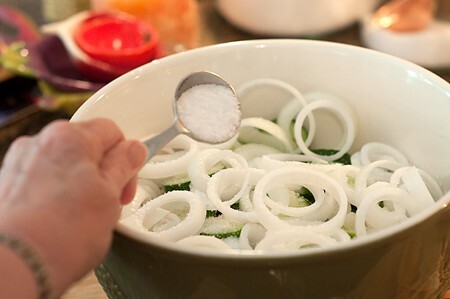 Place the cucumbers and onions in a large bowl and sprinkle with the salt. Toss so that the salt is distributed throughout the vegetables. Allow to stand at room temperature for two hours. Drain the cucumbers and onions in a colander. Rinse thoroughly and drain again. Spread the vegetables on a double thickness of paper towels and pat dry with additional paper towels. Prepare 3 pint (or 6 half-pint) jars by washing in hot soapy water and rinsing well. Prepare lids and rings according to manufacturer’s directions. Fill a boiling water canner 3/4 full with water. Add the clean jars to the canner and bring to the boil. Keep lids warm in a pan of barely simmering water. 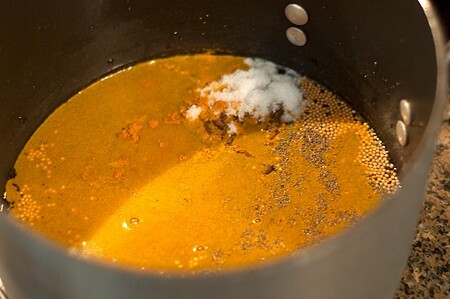 Meanwhile, combine the vinegar, sugar substitute, mustard seed, celery seed, turmeric, and cloves in a large saucepan. Bring to a boil over medium-high heat. Add the cucumbers and onions and allow the mixture to return to a boil. Working with one jar at a time, use a slotted spoon to pack vegetables into hot jars filling to 1/4 inch of tops. Ladle in pickling liquid to cover the vegetables. Wipe the jar rim with a moistened paper towel and apply a canning lid and ring. Rings should be just fingertip tight. Return the filled jar to the canner and continue until all jars are packed. When all jars are filled, lower the jars into the boiling water canner. Water should cover the tops of the jars by 1 to 2 inches. Cover the canner and bring the water to a gentle boil. Process for 15 minutes. Remove jars from the canner and place on a towel to cool completely. After the jars are cool, check to make sure the seals are complete. Store in a cool, dark place for up to one year. Refrigerate jars after opening. Hmm, interesting and something I might never have considered doing for fear of messing with the canning Gods. I sure do love B&B pickles but I sure would love to not have them include so much sugar…thinking I might have to try this for a couple of jars…thanks Lana. I know just what you mean, Barb. I rarely will use a canning recipe that hasn’t been tested and approved by the USDA. Unless you have a lab and know how to do the testing, you really can’t state with authority that a recipe is safe. That being said, however, based on about 30 years of canning experience I feel 99.9% sure this would be completely safe. The solution is pure undiluted vinegar with spices and sugar substitute added. The vinegar should easily make the product shelf stable. However, if you’re ever unsure you can always just refrigerate your jars from the very outset. Love the idea of a lower sugar alternative! Me too, Aly! These are totally guilt free! Between myself and our youngest daughter, we could wipe you clean of bread and butter pickles. Yum!! Kelli – it’s 1 1/4 (one and one-fourth) cups Splenda. Thanks so much! I commented on the pin and I’m sure the young woman will be able to make them now! I just made up a bath of these today. I want to congratulate you on the PERFECT measurements. I prepared an extra 4th pint jar based on some of my last experiences, ,but this was right on! Thanks. I can’t wait to give these a whirl. You should have used Bermuda/red onions. DOH! I am new to canning! Are these pickles ready to eat immediately? Or do they need to set for so long? If so how long? They’re best if you let them sit for at least a week before eating.